There’s a lot to love about Jaén, the Spanish province where I lived and worked for the 2012-2013 school year. From olive oil to Renaissance architecture, to free tapas and natural parks, Jaén is one of my favorite rincones (corners) of southern Spain. I talked about all these things in a guest post I wrote on Young Adventuress a year ago, but I completely forgot to mention one of the biggest draws to Jaén, its castles! 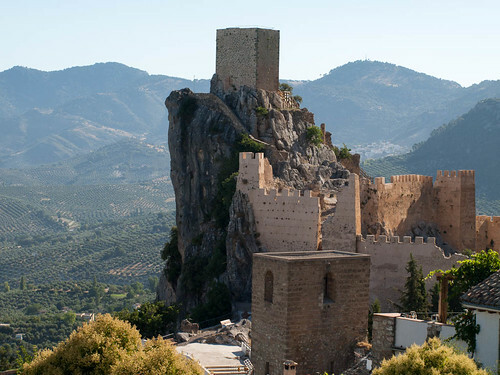 Fun fact: the province of Jaén has the greatest concentration of fortresses and castles of any region in Europe! 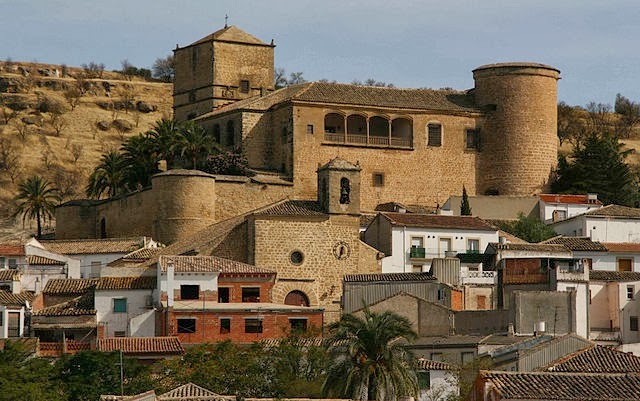 Due to its strategic location as the frontier between Christian Castilla and Muslim Granada in the Middle Ages, almost 90 castles in this province alone have been preserved down to the present day. Here are ten of Jaén’s most interesting castles…some of which I had the chance to visit, and others I’m kicking myself for never getting out of my apartment to see when I had the chance! 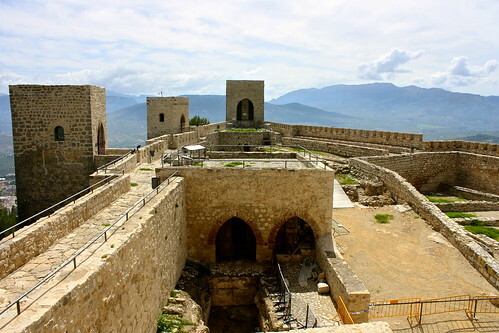 The Castle of Santa Catalina is what remains of a fortress complex that dates back to pre-Roman times, given the strategic location of the Cerro de Santa Catalina. After Jaén was conquered by King Fernando III in the 1200s, the existing Arab castle—the alcázar viejo—was taken over and a new structure was built as well—the alcázar nuevo. The old Muslim fort fell into disrepair over the years and was damaged during the 19th-century Napoleonic occupation, ultimately (and tragically) getting bulldozed in the ‘60s to make way for the new Parador, or fancy state-run hotel. From the grand viewpoint of the giant marble cross beyond the prow of the castle, you can take in the entire spread of the capital and also make out tiny villages in the distance. 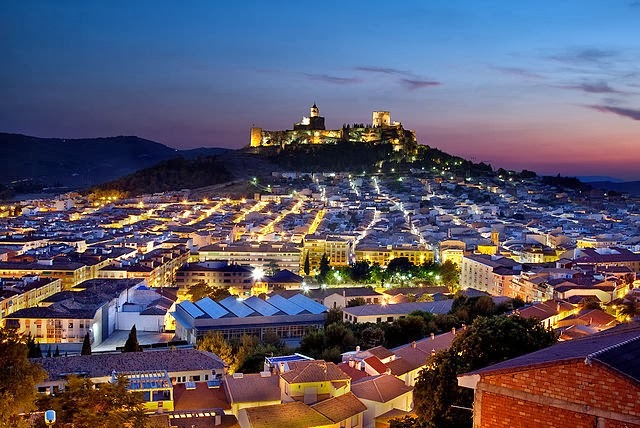 How to get there: As the provincial capital, Jaén is well-connected to the region and the country via trains and buses. To get to the castle, drive up in a car, take a taxi, or follow the signs and hike up on foot. During Golden Age Spain (the Renaissance), a man named Francisco de los Cobos happened to be the secretary of state to King Carlos I—and also happened to be from the area. At the same time he was polishing nearby Úbeda into a Renaissance gem, Cobos razed Sabiote’s medieval fortress and commissioned Andrés de Valdelvira to create a palatial-military complex, the Castle of Sabiote. Ominous walls guard numerous halls, courtyards, and dungeons within, but the French occupation in the 1800s seriously damaged much of the castle. 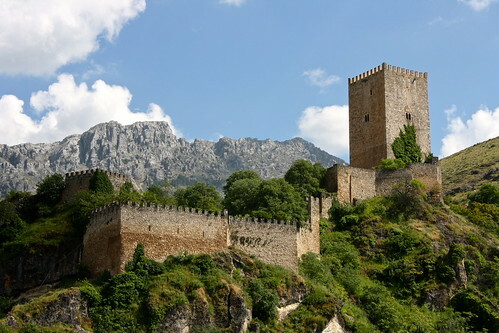 During the past decade the city has heavily restored the castle, which is now open to the public and is the star of the town’s new annual medieval festival. How to get there: From Úbeda, take the Navarrete bus. The castle is on the northeastern edge of town. A Castilian-era fortification built over Berber-era foundations, the Castle of La Yedra (“ivy”) sits on a lush, commanding promontory which the Cerezuelo River flows around on its way through town. 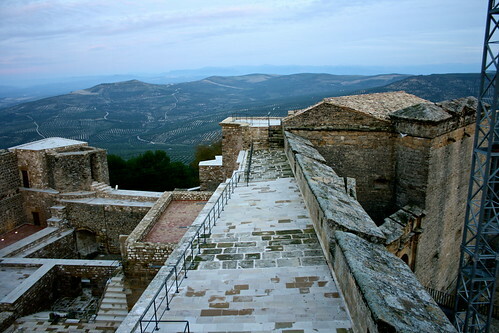 The views into Cazorla from the castle are lovely, and inside the keep tower you can learn about traditional ways of life at the Museum of Arts and Customs of the Upper Guadalquivir. How to get there: From Úbeda, take the Alsa bus. The castle is due south of the bus station, across from the Plaza Santa María, but to actually get up there, continue south of the city until you reach a switchback that turns north uphill. 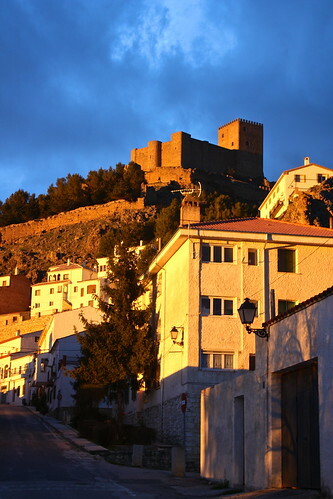 The Castle of Segura de la Sierra stands at one kilometer above sea level, and the rest of the village spirals out down the hill. Deep within the Segura mountain range, Segura de la Sierra was one of the first Andalusian settlements to be lost by the Muslims during the Castilian invasions in the 1200s. The original construction was destroyed during the conquest and rebuilt—the castle we see today. From the battlements and towers you can spot El Yelmo, the highest mountain in the region. How to get there: Segura isn’t served by public transportation, although Alsa runs buses between next-door Orcera and Úbeda. You could take a 4km hike from Orcera, through the mountains and olive groves, to Segura (one hour), but perhaps catching a taxi would be a better option. The castle’s at the top of the hill. In Arabic, al-qala’a simply means “castle,” and this town’s name refers to the Fortress of La Mota, “the butte” that rises over the village. 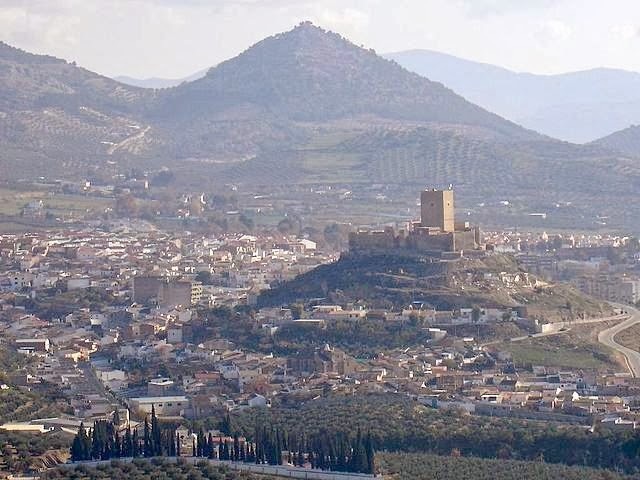 For a hundred years, Alcalá la Real (far to the southwest of Jaén capital) served as a major border town between Castilla and the Nasrid Kingdom of Granada, but as the Reconquista marched south, it fell to the Castilians and the mountaintop fort fell into disuse. Interestingly, the French repaired it during their occupation, adding new defensive walls. Today, after much restoration by the Junta de Andalucía, you can explore a military citadel (alcazaba), a church, and various towers. How to get there: From Jaén (or Granada even! ), take the Contreras bus. The castle is on a hill on the west side of town. One of the oldest and most well-preserved castles in all of Europe, the Castle of Burgalimar in Baños de la Encina guards the northern marches of Jaén province. Built in 968 by orders of Caliph al-Hakam, its fifteen toothy towers rise up from a concrete-like construction that forms its mighty walls. “Burgalimar” comes from the Arabic Bury al-Hamma, which means “castle of the baths” (think hammams), which closely resembles the town’s name in Spanish—“Baths of the Oak.” Of all the castles I’ve yet to visit in Jaén, this one rises to the top of the list, simply because it’s so dang old! How to get there: From Jaén or Linares, take the Samar bus. The fortress sits at the southern tip of Baños. Whenever I would leave Úbeda for the Linares-Baeza train station, the bus would always stop at Canena along the way, a podunk village that, somewhat randomly, holds an impressive Renaissance-era palace. Following a similar path as Sabiote’s castle, the Castle of Canena was designed by Andrés de Vandelvira for Francisco de los Cobos in the 1500s—a simple, rectangular structure with round towers at the corners and a stately arcaded courtyard inside. Today it’s still in private hands and only opens on Monday afternoons. From: Several Alsa-run buses link Úbeda with Canena, the train station, and Linares. Like Alcalá la Real, Alcaudete is to the far southwest of the province, and for a time was another border town between Castilla and Granada as al-Qabdaq, “natural springs” in Arabic. When the Reconquista came through in the 1300s, the Moorish fortress that dated to the times of the Emirate of Córdoba was destroyed and then rebuilt by knights of the Order of Calatrava, the one you can visit today near the nucleus of the old town. How to get there: From Jaén, take the Ureña bus. Alcaudete’s castle is on a hill on the western edge of the city. A hop, skip, and a jump from Cazorla near the mountains to the east of the province, the tiny yet fiercely-independent hamlet of La Iruela is home to a small castle that perches dramatically on a peña or rocky crag. The Knights Templar built what you can see today on top of a Moorish core, and from the top of the keep tower you can really appreciate the beauty of the rolling, olive-grove-studded hills. How to get there: From Cazorla, it’s a short 2km walk (30 minutes) around the foothills of the mountains to the northeast. Do you enjoy exploring castles when traveling? Have you ever been to the province of Jaén before? Which castle sounds the most interesting to you? Tell me about it in the discussion below!